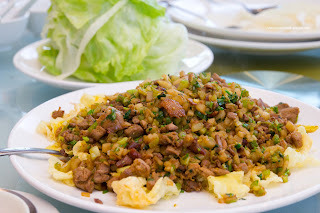 Some of you might wonder why my father and mother-in-law love to go to Tung Sing Chin so much. The reason being is that my father-in-law is friends with the chef and the owner. 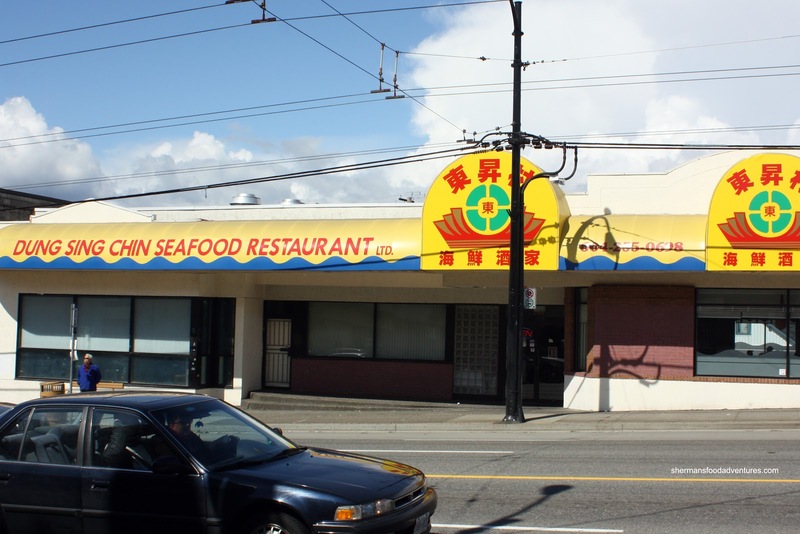 He used to run a large Chinese restaurant himself and hence, he practically knows half the Chinese restauranteurs in Vancouver. Hmm... I guess I should've thought of that before I expressed my opinions about some of them... Nah! Gotta be honest right? One things for sure, I'm so glad they changed their English name from Dung Sing Chin to Tung Sing Chin. In a previous post, I did point out that they shouldn't be using "dung" when they are serving food. Not good for business... And yes, the picture you see of the front is an old stock photo. I just didn't feel like crossing the street to take another! The reason why we were here for dinner this time around was for my father-in-law's birthday. We had a feeling he'd choose this place... 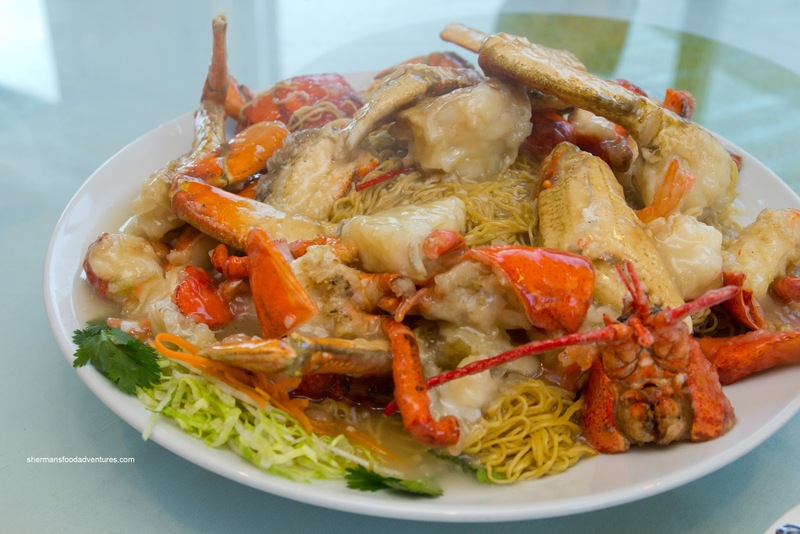 So, we started with a combination of Lobster & Crab on a bed of noodles. Both of them were meaty and fried properly where the meat was cooked all-the-way through while maintaining a bouncy texture. There was a lack of sauce though, where the large amount of noodles soaked it all up. The sauce itself was mildly seasoned and with so little, it was hard to actually taste it. 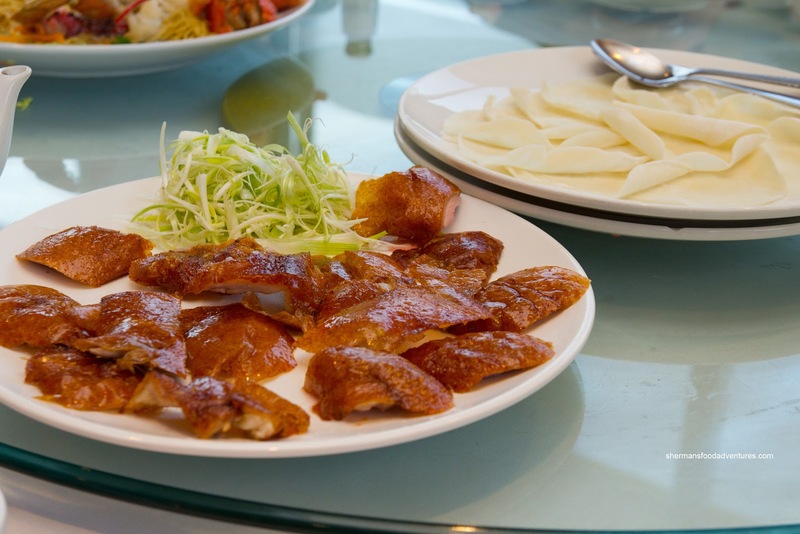 Next up was the Peking Duck which was carved table side. Despite it's golden appearance, the skin was not all that crispy. Furthermore, the fat underneath was neither rendered nor removed. Hence, most pieces were chewy and hard to eat. Another problem was the duck meat that was attached to the skin, it was also quite chewy. My son, the Peking Duck connoisseur, was not impressed. When there is Peking Duck, there is a good chance the next dish would be Duck Lettuce Wrap. First of all, I've never seen lettuce so hacked up in my life that was not part of a salad. That made it difficult to wrap as things starting falling out. The large chunks of duck were pretty chewy, however, the veggies were crunchy, which made it an okay dish overall. I liked the addition of pickled vegetable which added more crunch and acidity. 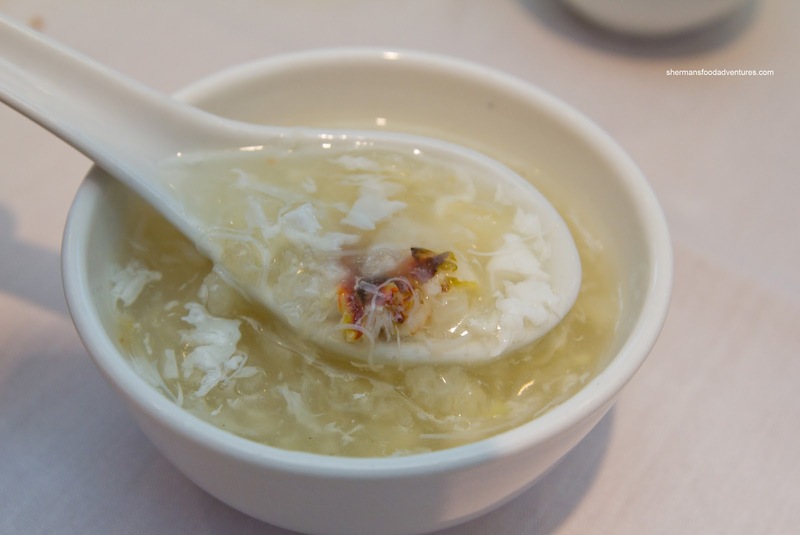 With the duck courses out of the way, the Fish Maw & Crab Meat Soup arrived. The soup was very mild with lots of crab and fish maw (which was cut up into good sized pieces). The soup had a silky texture and stayed thick until the last spoonful. 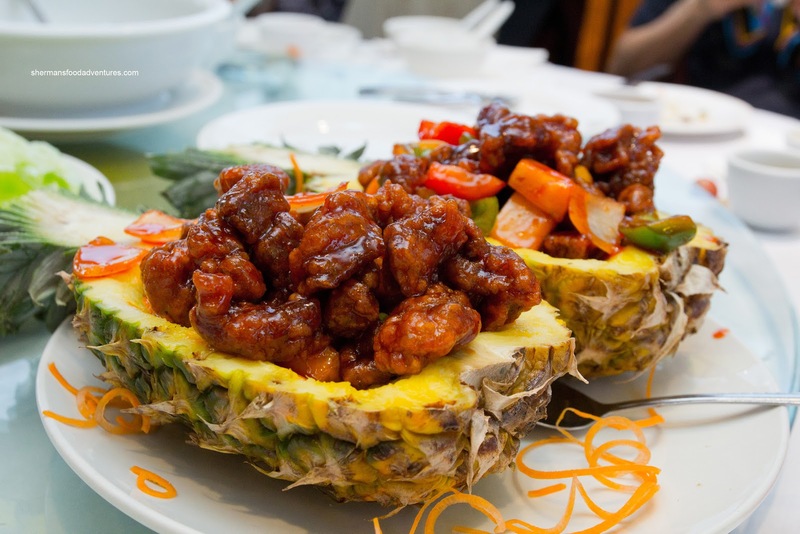 Unexpectedly, the Sweet & Sour Pork arrived in a large portion plated in a hollowed-out pineapple. Okay, I'm pretty sure this is not how serve it normally. As for the dish itself, it was pretty good. The pork was crisp while moist inside. There was just enough sauce to coat each piece which ensured that some crispiness remained. The sauce was more sweet than sour though. 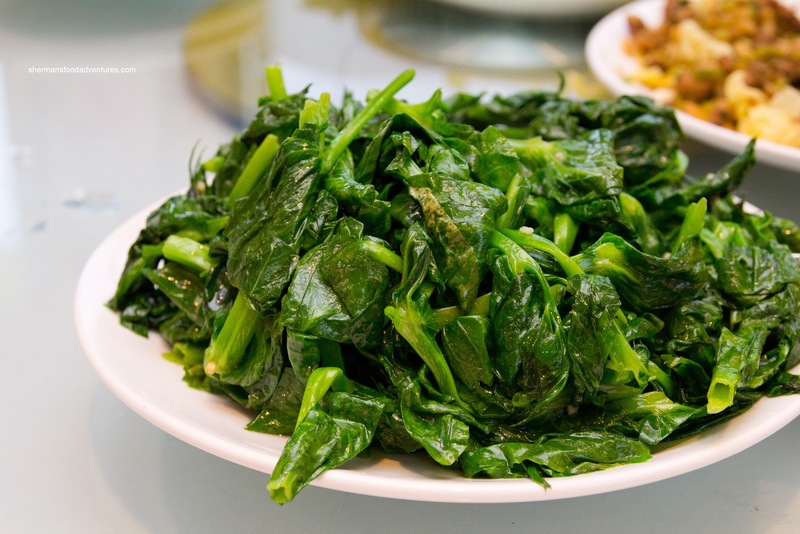 Up next was finally a "healthier" dish being the Stir-Fried Pea Shoots. It was a pretty large portion which was not glistening with a layer of grease. Therefore, it was "healthier" than usual. The pea shoots were just barely cooked, hence there was a crunch. We could clearly see the garlic in the dish, but it was not that apparent. In fact the whole dish was under-seasoned and could've benefited from more salt. 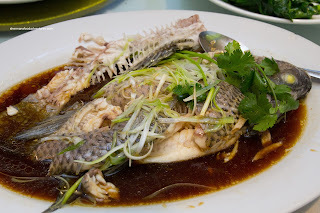 Excuse me if I don't sound too excited with the Steamed Live Tilapia. I've never been a huge fan of the fish since the flesh can be rather soft and mushy. However, it wasn't too bad in this case because it was barely cooked. Therefore, the meat was still somewhat springy (in a mushy tilapia kind-of-way). With that being said, I'd much prefer some rock cod (which is practically impossible to get or too expensive these days...). 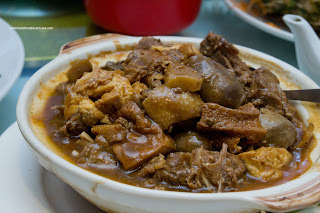 Lastly and ironically our least favourite dish was the Goose Hot Pot. Depending on which piece, it would range from tender to chewy. I didn't find the meat too gamy, but that was probably masked by the fermented tofu dip. I found some of the fried tofu overdone and completely disintegrated in the sauce. An okay dish, but I would've preferred lamb instead. In general, I thought the food was hit and miss, where some dishes could've benefited from more seasoning. On a related note, I've returned for more meals since then and nothing has changed. 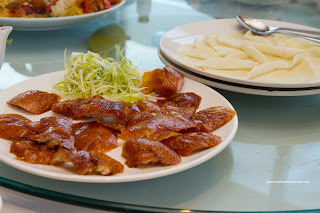 The Peking Duck really needs work and the rest of the food can be good, but can be pretty bad too. Definitely hit and miss... I wonder if my father-in-law will read this??? Food looks decent. I'm a sucker for crispy, well-made S&S Pork, and that one got my attention. Might try them out. Do they also do dim sum ? Maybe if you added some pics of their interior, it'd be good to see how bad it is inside. @LR Food looks okay, but I've been here for dinner since then and really, it is super inconsistent. Also, the Peking Duck needs a lot of work. Yes, they do Dim Sum and that is good. The interior is not crappy per se, but it is in need of some cleaning.